Welcome to Buy AFC Valves. We invite you to browse through our store and shop with confidence. To view a valve description, just click on the model number. We invite you to create an account with us if you like, or shop as a guest. Either way, your shopping cart will be active until you leave the store. AFC Model 111 is a small low pressure solenoid valve can be used with fuel, air and other media. The valve has a working pressure range of 0-30 PSI. Each valve is tested for low and high pressure leaks and dielectric breakdown. AFC 301NCBN (12v)is a normally closed 3-way solenoid shut off valve engineered for high pressure applications. Bracket slots measure .35 x .62 for easy mounting. 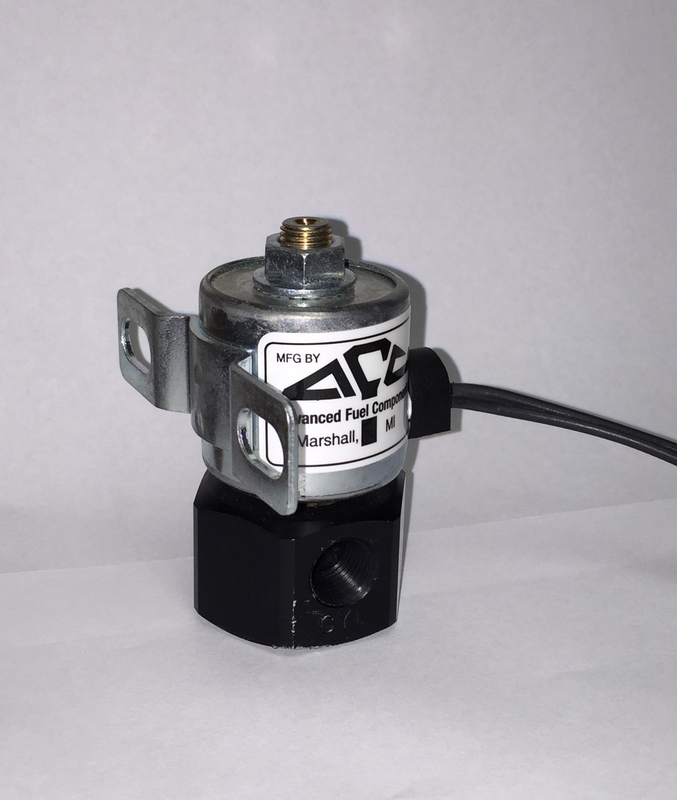 AFC Model 121 (12v) is an extremely versatile solenoid valve that can be used in many applications, such as lift truck, air dump, air fan clutch actuation, and many more. AFC model 121R (12v) solenoid valve has a reduced draw coil, which decreases heat while the valve is operating. The 121R is is designed and recommended for RV and Boat applications. AFC Model 123 is versatile solenoid valve that can be used in many applications, such as lift truck, air dump, and air fan clutch actuation. This valve is identical to the AFC121, except it is ported on the side and bottom of the valve. AFC Model 151 is a compact high pressure multi-purpose solenoid shut off valve engineered for use in RV, marine, automotive and dispensing applications. Each valve is tested for low and high pressure leaks. AFC Model 152 is solenoid shut off valve with an inline filter for use with air, gas and other media. The valve provides high performance filtration. Each valve is tested for low and high pressure leaks. AFC Model 161 (12v) is low draw (less than 1.7amp) for use with air, gas and other media that will work in low and high pressure applications. Each valve is tested for low and high pressure leaks. AFC Model 173 (12v) is a low draw (less than 1.7amp), low pressure solenoid valve for use with air, gas and other media that works with low and high pressure. Each valve is tested for low and high pressure leaks. AFC Model 190 (12v) is a direct acting, instant on solenoid valve for use with air, gas and other media. The Model 190 works up to 350 PSI, and is designed for maximum flow. Each valve is tested for low and high pressure leaks. AFC Model 195 (12v) is a direct acting, instant on solenoid valve for use with air, gas and other media, including dirty gas. The Model 195 works up to 350 PSI. Each valve is tested for low and high pressure leaks and dielectric breakdown. AFC 211B-12MWH (12v) is a high pressure solenoid shut off valve rated to 3600PSI. Engineered for high pressure tank applications in chassis and engine compartments, such as bus and truck CNG applications. AFC 301NC (12v) is a 3-way solenoid shut off valve, engineered for use in high pressure tank applications in engine and chassis compartments. AFC 301NO (12v)is a normally open 3-way solenoid shut off valve engineered for high pressure applications. Copyright © 2009-2019 Buy AFC Valves. All rights reserved.